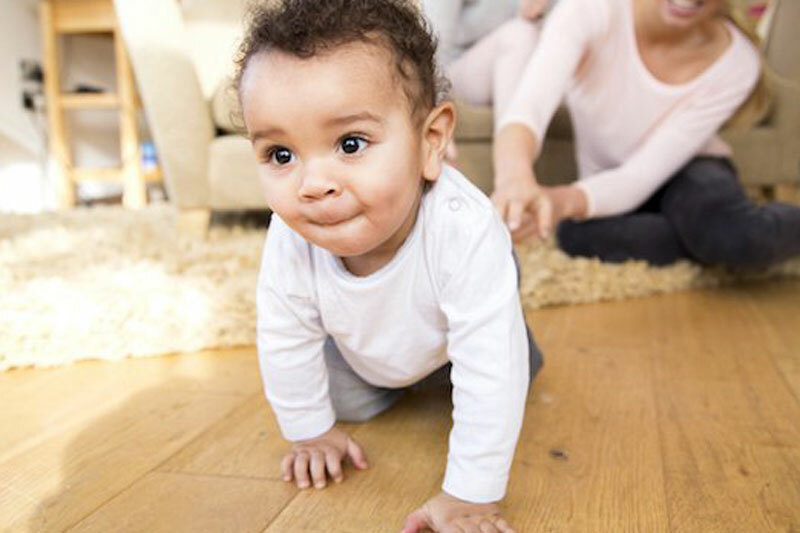 Even if your little one has moved on from crawling and is cruising around the furniture, there’s lots of reasons to coax her back on all fours for a bit of crawling fun. Research shows that crawling has a wealth of benefits for littlies that go beyond developing them physically. While some cheeky babies skip the crawling stage altogether and go straight from sitting to walking, you can still ensure your go-getter is reaping all the good things that come with working out her left and right brain by having fun with her on the floor. We’ve listed the biggest benefits of crawling below, as well as some crawling games that will help encourage your baby to either start crawling, or do more of it. As well as developing her gross and fine motor skills, crawling helps with balance, hand-eye-coordination and overall strength. The development and refinement of these skills will also help your child when she’s older with running, jumping, writing, fastening clothes, and throwing balls. Your baby will also be prepping her body for walking by exercising certain muscles needed to hold her upright. As babies become mobile they also learn how to navigate obstacles, develop spacial awareness and also start to figure out work around solutions to things in their way. Can’t crawl over the chair? Hmm, maybe I can crawl through it? That sort of thing. This early thinking forms the basis of later more advanced problem-solving skills. By looking at a distant object on all fours and then refocusing on their hands in order to reach that object, your baby’s eyes are adjusting to varying distances. This encourages her eyes to work together and this skill assists her in later life with all sorts of things from driving a car to catching a ball and copying the words off a board at school. When babies start to co-ordinate their arms and legs in a fashion that propels them forwards, they are doing something rather incredible. It’s called ‘cross-lateral integration’, which is when the left and right sides of our brain have to work cooperatively with our body. In order to function at our best, these two sides of our brains need to be in full communication with one another. Once your bub has strengthened her muscles from all that tummy time and has started crawling, you can start to play with her in a new way now that she’s mobile. These games will not only encourage her in her crawling but will also bring on the squeals of joy! Soft balls, especially ones with a bell inside that chimes when rolled, are great for encouraging your baby to ‘chase’ after them. Likewise, you can encourage this with a push-along-toy that you roll in front of your baby and then praise her for attempting to reach it. Coax your little one into scampering through a tunnel by opening the two ends of a cardboard box. You can also roll a ball through it and encourage her to follow it. Toss some different textures on the floor, such as a soft sheepskin, a rubbery bath mat and some scrunched up paper and encourage her to explore them. Get down on all fours with your little one and crawl away from her, encouraging her to come after you. Throw some cushions and airy pillows on the floor and your little mover will delight in trying to crawl over them. 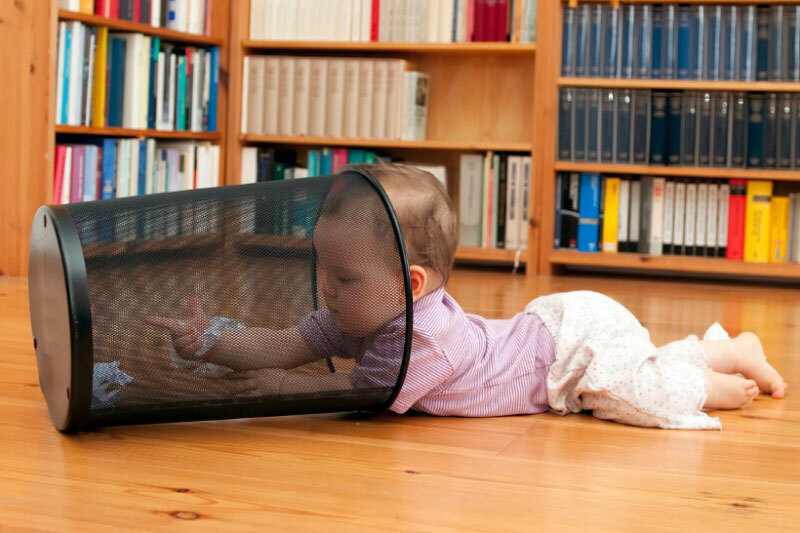 Encourage your baby to get moving by hiding a favourite toy in an obvious spot she can see and letting her crawl towards it to ‘find’ it. Give her lots of praise for trying to do so. If your baby isn’t a crawler yet, or has decided it just isn’t for her, try not to panic. All babies develop in their own time. Also, while it’s considered normal for some babies to skip crawling altogether, if your child is over a year old and you’re concerned about her lack of crawling, seek advice from your GP.